There has never been a more abused and misunderstood ritual than the Golden Dawn’s Lesser Ritual of the Pentagram (LRP). Along with the Cabbalistic Cross, it has been kidnapped by others who have unintelligently hammered it into their own traditions. Even though it is included in almost every occult handbook in the Western Mystery Tradition, few have tried to define what it actually does or look at it in context of the Golden Dawn tradition. Before we start, let us make this clear. The Lesser Ritual of the Pentagram has about as much to do with elemental magic as a packet of peanuts has to do with the workings of poetry of William Topaz McGonagall. As we will see, this myth has come about because of a fundamental lack of understanding about the Golden Dawn and how it worked. The failure to understand the depth and power of this simple ritual has lead many armchair occultists to develop ‘improved’ versions. While these improved versions might ‘work’ within their own traditions, they do not work within the context of the Golden Dawn system. To an innocent candidate, the pentagram in the LRP was a complete, classic magical sign that was drawn in four directions by the operator. Also the mindset of the order and the people who went through it, was you did what you were told. Only the very stupid would NOT realise that the angels were Archangels but the impact of what a six-rayed star being between the columns was, would have passed most by. As for colour, the GD was extremely protective of the use of colour in the outer order and it is extremely likely that the whole operation was monochromatic. It was only in the inner order, when this was developed, that colour became particularly important. Some of this material was leaked out into the outer order. For example we find that in the later Whare Ra temple 0=0s were given black cards with the divine name and the pentagram in colour to stare at to add their visualisation of the ritual. We also know that it is impossible for the LRP to be linked to any elements because it lacks a spirit pentagram as part of the rite. It would be an anathema to the GD’s rule of always “invoking the highest first” before doing any working not to have included a spirit pentagram first. When elemental pentagrams are used, they have to be accompanied by a spirit pentagram something which is clearly lacking in the LRP. The first reference to an LRP pentagram being used in an exorcism within the GD is in Flying Roll XXXIV where Brodie Innes uses a pentagram to deal with an Earth elemental which was bringing sickness to his wife. However, on examination of the case, Innes does not perform an LRP at all and instead invokes the elemental to give it form before blasting it. Innes was also an adept at that point and well capable of using the full versions of the pentagrams. Another case is recorded in Dion Fortune’s Psychic Self-Defence where she draws a pen- tagram between her and an astral creature and vibrates a divine name. Again nothing like the LRP , although it shows similarities. Later in her book, she gives a watered down version of the LRP as a tool for exorcism but strips it of a lot of its GD symbolism. Much of the alchemical and exorcism attributions for the LRP seem to have come from Aleister Crowley. While it is possible that he got these from Bennett or Mathers, it is also likely he got them from his own meditation. However, Crowley’s use of the LRP forced him to make some changes to the function of the Rose Cross Ritual. It is from him (and later Dion Fortune) that we get the idea that pentagrams light you up on the astral, whereas the Rose Cross Ritual keeps you nicely incognito. By the time Israel Regardie appeared on the scene, these attributions were being adopted at least outside the existing GD. The pentagram is associated with the planet Venus, because when viewed from Earth, successive inferior conjunctions of the planet plot a nearly perfect pentagram shape around the zodiac every eight years. This is important when you consider that entry to the vault of Christian Rosenkreuz is through the Venus wall. Another attribution is its association with the five-pointed star of Geburah. In this guise the pentagram is showing humanity’s ability to control things and spirits because of its five-fold nature. Since most of the universe is populated by elemental or pure spiritual beings, the fact that a human is a mixture of both gives them considerable protection and power. But as far as occultists are concerned, the pentagram is a symbol of a perfected human being. It is a symbol of spirit ruling over the elemental nature. Within the Golden Dawn there were several advantages to making a junior person learn the LRP . Firstly, it would teach them how to vibrate names and make correct ritual gestures and visualisation. The LRP also works within the framework of what should be carried out within the outer order. That is, the integration of spiritual energy within all aspects of daily life and a balancing of the personality. The use of a regular ritual has been applied in many religions as a method of rooting the spiritual within the mundane. But once students started doing the ritual, often they would wonder what it was all about and start to look at the symbolism involved and might look particularly at the meaning of the pentagram, which was a symbol of perfected man and a declaration of the dominion of spirit over the elemental nature. However, there is more to it than that. There were magical meanings held within the ritual which linked it to the student’s 0=0 initiation and to an extent the whole of the first order work. The idea was to require the operator to subconsciously repeat the work of the outer or- der in the microcosm of the candidate on a daily basis. This becomes the work of the outer order until the person becomes the completed pentagram at portal. In a nutshell, the commonly used LRP has the operator/candidate standing in the centre of the uni- verse, between two pillars, with his or her higher self within the heart centre, flanked by four archangels and on all sides a symbol of the dominion of spirit. This is sending a powerful message to the unconscious mind that they are a channel for their spiritual selves. This is exactly the message that the candidate is given through the 0=0 cere- mony, the realisation of what it means is also glimpsed in the 2=9, when the candidate first sees the completed pentagram in the East. In other words, what we are seeing with the LRP is not just a clearing exercise, or even an elemental balancing rite but a re-enforcement of the rest of the grade work of the outer order. It is activating the whole of the order in the Sphere of Sensation of the candidate. It is easier to understand the function of the banishing ritual when you look at the Golden Dawn’s idea of the Sphere of Sensation. The concept of the sphere is mentioned in several documents, mostly related to scrying and the Z documents, where it is a part of the 0=0 initiation ceremony. There is much that is original in the idea, which is explained in the document ‘Macrocosm and Man’ yet the idea appears undeveloped. The idea of a Sphere of Sensation works as a canvas on which an auric energy system can be painted. Brodie Innes says in Flying Roll XXV that the Sphere of Sensation is an egg-shaped aura around the body which made out of ‘Akasha’. Akasha is an Eastern term meaning ‘Ether’ and in context the statement means that it is made of lower forms of ‘spirit’. In the pre-Einstein physics, ether was the unseen energy that held the universe together. Although you could not see it, it was still a semi-physical force. In the Indian philosophy which influenced the Golden Dawn, Akasha was also the spirit that bound together the four elements. When Brodie Innes was saying that the Sphere of Sensation was Akasha, he was saying that it was made of an unseen spiritual energy. However, Akasha has some other abilities, which Brodie Innes was hinting at. It is the memory of the Mind of God and it holds everything in reflection. One drop of Akasha contains a reflection of everything seen, unseen, past and present. He would say that the Sphere of Sensation is “as the Microcosm and the Universe as the Macrocosm; regarding the former as a reflection in miniature of the latter, as in a grass field full of dewdrops each drop might present a perfect tiny image of trees and mountains, the sky, clouds, the sun and the stars.” In other words, it is like a hologram of the universe that can be cut multiple times and still contain a complete likeness of the original. This is a Microcosmic universe and is built around symbols that the individual has in their unconscious mind and is made out of the patterns of their material life. The GD students built the tree of life within their sphere of sensation over a period of time and used its spheres rather than those of the eastern chakras. Brodie Innes at- tempted to link the Sphere of Sensation to what is called the Aura, and from that point to the complex tantric work of the East. Like many good theosophists, he believed that India contained much useful magical information which could be taken at face value as being superior to that in the West. He was only partly successful because his efforts were not required to get the sphere of sensation working. Most Hindu or tantric experts would tell you that the aura of the east with its chakras is a thought-form construction exactly like the Sphere of Sensation and not meant to be taken literally either. It would be better to use a symbol that is more closely related to Western symbolism like cabbalistic the Tree of Life which was what the GD actually did. All this information would not be known to the outer order candidate. They would not even hear about the Sphere of Sensation until they reached the 5=6 grade. However this did not mean that their own sphere of sensation had not been orientated to this particular format. Mathers, in his Z2 instructions, tells the officers that they must visualise the candidate’s sphere of sensation as having these pillars within them. As the candidate comes into the temple, they are supposed to have a dark and cloudy Sphere of Sensation which becomes clearer at each purification and consecration. The number of purification and consecrations is the same as the number of black and white pillars in the aura (The Middle Pillar being activated by the balanced light of the Supernal Triangle). The fourth and final consecration is important from the point of view of the LRP . There, the candidate is standing between the pillars his or her hands on each one, in an exact mirroring of the the pillars in the Sphere of Sensation. In the Golden Dawn, whenever you see pillars, they represent some form of gateway. In her private articles for the Society of Inner Light, Dion Fortune hinted that the two pillars in front represented the future while those behind represented the past, while the gate- way formed on the right and left hand, and the Middle Pillar are the present. So what you are looking at when you look straight ahead is your future. Symbols that you might see in your own Sphere of Sensation are those that are gearing up to actually manifest. Those behind you are what have already gone. Symbols close to you are the those which are with you now. To understand the concept of how the Sphere works and communicates it is important to look at the Neo-Platonist idea of mind and symbols. The Neo-Platonists believed that all things are the products of a divine mind and the only way that an object can be created is by using material or by reproduction. The One Thing can do neither because it is infinite so it cannot take any outside source and can only make its universe in its mind. Once you realise the universe is mind and works in the same way as your own (which is a reflection of the universe) then you can use it to bring about change. The Universal Mind does not talk in words as such. It uses symbols. A word is a symbol, but it only generally means one thing. A real symbol means lots of things on many different levels. Likewise, the Sphere of Sensation operates on symbols, which it uses a bit like a com- puter language to program the environment. It takes Macrocosmic symbols and con- verts them into personal ones. These reflect back on the Nephesch and the physical body. Our Spiritual side also communicates with us through the Sphere of Sensation using symbols. We are born facing the wrong way. Our loyal servant, our Sphere of Sensation shows us a distorted vision of the Universe. Our lives are based on incorrect perceptions founded on clouded understandings of the symbols. We often see symbols but can only see them “in a glass, darkly”. Soon optimism gives way to depression, the small becomes large and our view becomes narrow and clouded. In addition, people form links with others through shared magnetism and corrupted symbols. Their Spheres of Sensation become linked and Akashic energy becomes depleted. As people age, they become more fixed and are unable to see the new Universe which is being born around them. Instead they either keep symbols of their own universe, or just live their lives as they always have done. In such circumstances, the Higher Aspects of the personality lose their ability to influence the Sphere of Sensation and the person finally dies. The LRP makes changes to the Sphere of Sensation so that the person gradually devel- ops. It does not so much do this by banishing, as it does by placing powerful symbols within the sphere of sensation which become enforced over a period of time. First you perform the Cabbalistic Cross. This draws down power from the crown to the feet. It balances and energises the sphere for more important work. It also opens the Tiphareth centre to control the operation. Next you draw a pentagram between the pillars of the sphere of sensation in front of you. You vibrate the name YHVH, which means “I am what I am” again aspirational. In other words, you are placing the symbol of the pentagram into your own future and energising it with your own will. You are looking towards your own portal ceremony where the completed pentagram is unveiled for the first time. The YHVH name is important because you are talking about integrating the elements under the power of spirit. When we draw the pentagram on the right hand, we are making a statement of who we are ‘now’. The divine name here is Adonai, which means Lord. We are saying that we are rulers of ourselves. Now the operator turns around again and is placing a pentagrams over their past and saying the name associated with YHVH, EHVH. This means “I am what I will be.” The operator is looking at their own past and saying “I am not trapped by my past, I am going to be something better”. You will note that this name is in this position because the operator at that moment has his or her back to the future. The last pentagram is placed between the pillars of the left hand. This represents the gateway to the North which is connected to the Earth. But again it is also the now. The left-hand gateway leads to the ‘now’ of the outside world, the right hand gateway leads to the inner kingdom. The divine name here is Agla (Mighty art thou Lord of the Earth). What is being said here is that the operator is the ruler of the Earth. Not the planet, but our own personal Earth. Notice that the person has their back to the right-handed pentagram where they are talking about being Lord of their own Inner Kingdom. Now they are claiming that what they see is a product of their own rulership. The next part of the ritual sees the placement of the Archangels. Most people see the Archangels as wearing their elemental badges. Alternatively they are just seen in the light of the Jewish child’s bed-time prayer. It is important to look at who these Archangels are within the GD system. Before me refers to the future. Raphael means “God has healed”. We are asking that God will heal us and guide us. He is also the Sun angel in the Western Mystery Tradition and therefore the initiator into Tiphareth (the 5=6). This refers to the past. Gabriel is the ruler of the Moon. We are making him the guardian of our unconscious mind and preventing our past from destroying ourselves either now or in future. His name “God is my Strength” tells us to build our life not on our past but on the foundation of God. Michael means “who is as God”. He gives us the image of our inner Kingdom as matching that of heaven. 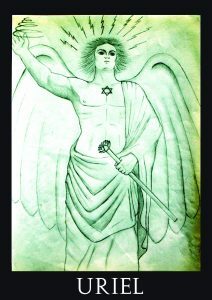 Uriel was the Angel of the Mysteries. His name means ‘Fire of God’ by placing him as the Guardian of Gate of the Earth we are allowing the Earth to be our teacher. The “Fire of God” is the serpent force represented by the staff of the Kerux and his function in the LRP is similar. The next part of the LRP the operator says a phrase that only makes sense when you see it in terms of sphere of sensation with its four pillars. The six-rayed star refers to Tiphareth and the Middle Pillar. Until now, the operator has not activated the Middle Pillar and in so doing causes the magnetic balance of the four pillars to come into harmony. Once in harmony, you are bringing the light of spirit into the heart centre of the Sphere of Sensation using the symbol of the Hexagram. This causes the Sphere of Sensation to glow with integrated power, just like the candidate in the 0=0 ritual does when they have received the fourth and final consecration. The insistence on the LRP before ritual, plus the name itself, implies that the LRP has a hygienic effect and can be used to create sacred space. It does this in two ways. 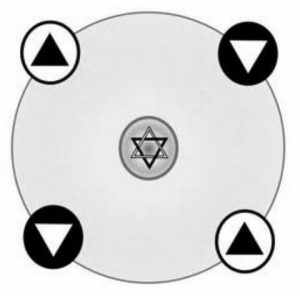 The first is by elevating the consciousness of the operator so that they are tuned into the symbols that were placed in their sphere of sensation during their 0=0 ceremony. The second method involves a physical change in the environment occupied by the sphere of sensation. The sphere of sensation is spiritualised and expanded to the four quarters. The spiritualised sphere produces a high range energy hum. This hum pre- vents lower astral beings which work on a lower spiritual note (which cause most of the problems in ceremonial magic) from entering the space. The Sphere of Sensation is projected outwards in a similar fashion to what it was during the 0=0 rite where the candidate has his sphere of sensation magically stretched to the same sub-quarters represented by the pillars in the Sphere of Sensation. In the 0=0 these points are represented by the invisible stations of the Sons of Horus. When you perform the LRP on an area before a ritual you are projecting your Sphere of Sensation to these sub-quarters. In most GD groups, this task is performed by the Heireus and it is not the officer’s Sphere of Sensation that is stretched but that of his God- form. Most of the time it will be whoever is performing the ritual who will expand their Sphere of Sensation for the purposes of a banishing. Over the years many people both inside the Golden Dawn and outside it have reported beneficial effects caused by the regular performance of the LRP. These effects range from clearing out of negative behaviour patterns to actual spiritual awakening and individualisation. Based on the concept of the Sphere of Sensation, it is possible that these effects can happen. The regular placing of symbols in the Sphere of Sensation of a willing person will slowly change their reality. The unconscious knowledge that their past, present and future are all under their own control, moves them from being a victim in life to a magi- cian of power. Negative symbols of powerlessness and weakness are slowly replaced with that image of occult power, the pentagram. The symbolic disconnection from spiritual reality is replaced with positive symbols enabling the higher aspects of the self to draw close. It is this effect more than others which makes the LRP a vital part of the daily routine of anyone using the tradition of the Hermetic Order of the Golden Dawn. This article was posted in the now defunct Hermetic Virtues. Originally written when I still thought it was all about banishing I have tweaked it a bit. It still deserves an airing. This is helpful to me. I have worked with and analyzed this ritual for 10 years, but this is fresh, reinforcing some of what I have learned, and helping me to have greater intention to keep using it with some new facets in mind.